Every year, when March is around the corner, Ethiopian social media activists start to be noisy. The defenders of Adwa as a phenomenal black history moment and the revisionists battle it out, often in a vulgar mode of exchange. Over the last two years, I have been observing this discussion between those who seek to promote the old narrative of state orthodoxy as the only and the universal meaning of Adwa and those who take a more sceptical stance seeking to show the darker sides that the Adwa moment signifies. The following paragraphs were written in response to those who seek to impose on the Oromo this exhausted old narrative of the ideologically motivated imperial State Orthodoxy. 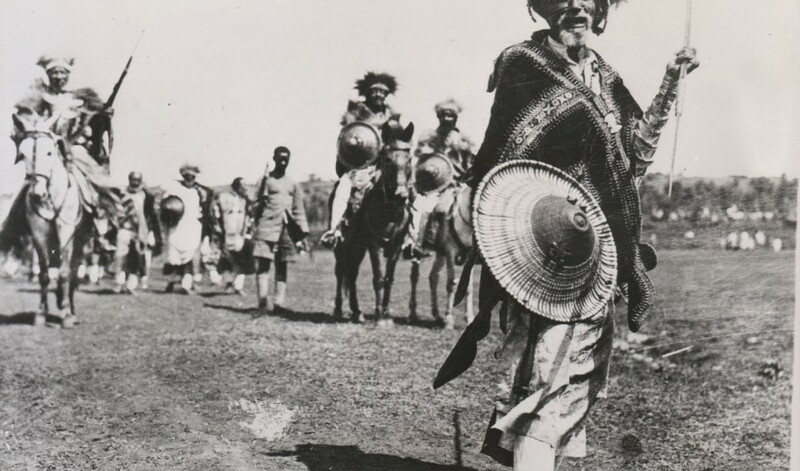 There are right reasons to celebrate the battle of Adwa. But to say Adwa is a black man’s war fought for securing the freedom of the people of the black race is celebrating the event for the wrong reason. Truth be told, it was a colonial war fought among colonial empires, framed by rules of colonial international law, with a colonizing consequence for Africa. It was a war fought between two maiden empires competing over the fate of black peoples in Ethiopia and beyond. This was clearly stated by the emperor himself several times, the emperor who also clearly denied that he is black, the emperor who rather mysteriously claimed to be Caucasian, the emperor who refused to identify with Afro-Americans and Haitians who saw him as one of their own and sought to salute him for his achievements at Adwa, the emperor who brutally murdered millions of black people, the emperor who personally owned over 70, 000 black slaves, the emperor who negotiated with white colonial powers on the fate of other black peoples (Eritreans, Djiboutians, Somalis, and the Sudanese) under white colonial rule. To say Adwa is a pride of black people, therefore, is a distortion of historical truth and a gross misrepresentation of the man and the event. To say that our people sacrificed, especially those of them who were in chains, to preserve a semblance of an African sovereignty; to commemorate the lives lost in that war and to honor the sacrifices thereof is the right reason to celebrate it. As someone whose forefathers have paid dearly for this and for the subsequent fascist war, I feel the pain, I share the loss, and I honor their sacrifice. As I honor their sacrifice and commemorate and celebrate the lives of the many black bodies lost there, I speak the truth, the whole truth, and stick only to the truth. To my compatriots who insist that we should celebrate it for the wrong reason, I insist in telling you the truth, the raw truth, especially on the issues we disagree strongly. Doing this is paying a proper tribute to the agony and anguish of those who lived and died in chains to defend a state that left them outside of the polity. To do this is a sacred duty, a civic duty, an act of loyalty–even to the state that is formed on my forefathers’ graves. This is an act of sacrifice, fully aware of the past and present reality of rejection in Ethiopia, completely cognizant of its violent beginnings and violent bearings in the present, totally imbued with faith in redemption, and immensely driven by the almost impossible hope of transformation, even of transfiguration. For you, I have only pity. But I like to restate to you in the strongest possible terms that I come from a people of hope and redemption. I note the fractured beginnings of the state. I note its violent inauguration. I note its deficits of pan-Africanism (which is still the reason that Ethiopia is IN Africa but not OF Africa). I note the Ethiopian State’s imperial and colonial beginnings. I note all of its ‘original constitutional sins’. And I will openly tell you about it. I will be happy to engage you in a conversation in public or private. And I do so because I believe in the hope of transformation. I believe in the hope of going beyond and above those inaugural wounds. I believe in building a better future in spite of, and BECAUSE OF, those wounds. I believe in the transfiguration of society. I will not pamper you. I will not come to you with half-truths. I will not mystify the objective truth. I will not shrink the meaning of the event or the historical figures into one and only one. I insist on multiple interpretations of Adwa and all other historical events in Ethiopia. I insist on multiple popular interpretations. I will not regurgitate and reproduce the state orthodoxy of the past as the truth or the one and only interpretation of historical truths. For far too long, we have seen historical narratives told to us ex cathedra. For far too long, the voices, the stories, and the narratives of peoples have been suppressed. For far too long, your grand narratives have ignored, silenced, and erased the voices of the peoples–especially the voices of the frontier peoples (the peoples who were never people in the democratic–the demos–sense of the term). Also, I will not flatter you, especially if the truth fails to flatter you. I won’t spare you from my wrath if you come and write a gibberish, or, even worse, your insults (as most of you are bent on doing). I promise you: I will return the compliment in kind, or I will block you. If you want a civil conversation, I welcome you (especially if you are willing to do your part of the home work). YOU HAVE COME A LONG WAY, EVEN TO THE MOUNT OF ADWA (for no gain or glory). You have survived darker days. You shall survive these ones, too. As we resist the present abuse, we also resist a hegemonic discourse that fetishizes the cause of all our ills into a benign state orthodoxy. Resist we will, in part because, to do so has now become our (unchosen) way of life. Resist we will, because for some of us, it has now become a way of being in the world. And we will do so in truth. … Told in love. … Told with an undying hope. Happy celebration of the peoples’ Adwa…and, for once, a celebration for the right reason.